There didn’t seem to be a sign anywhere to point out the entrance of Woodford F & B, but knowing we were at the right location – a building on the corner of Forest and Woodford – I knew we’d find it. Eventually we did, but the restaurant’s only signage was a menu on one window and the words “Steak Cocktails Happy Hour Seafood Brunch Good Times” on another. That all sounded good to me, so we walked in ready to take on the nearly hidden eatery which opened earlier this year. Not knowing anything about it in advance, the restaurant initially surprised us with its full-on diner feel and its modern, but still dineresque, bar. It was a pleasing atmosphere and one that seemed like it could become lively at times. The place was moderately busy with a few tables and bar seats still available. We were seated by the windows and provided menus that were a single sheet with food on one side and beverages on the other. Soon our waiter arrived with water and told us the drink menu was as-is that evening with no additions or subtraction to it. He left to let us decide what we wanted and we discussed what thirst quenchers were on our brains. Upon the server’s return, we had made our final choices about what to drink. After both considering the classics, we decided to run with some Woodford originals. She chose the Dark and Shrubby – house spiced Black Strap Rum, ginger-cranberry shrub. I went with the Woodford 75 – Maine Craft Distilling Alchemy Gin, Hillinger Rose “Secco”, lemon. My decision was finalized by the fact the it was the only drink with the name of the place in it. Sure, it was a little girly, but I’m not one to shy away from girly drinks, so I didn’t care. As soon as the waiter walked away to put in our cocktail orders, we set our gaze toward the food. The menu was pretty typical, but I made a couple of mental notes. First, the appetizers were under the heading of “Hors D’oeuvres” and the soups and salads were the “Appetizers”. The other notable was that every day had a Plat Du Jour, many of which looked pretty excellent. House favorites and entrees rounded out the food options. The menu certainly worked for upscale diner cuisine and I saw lots of items throughout that caught my eye. 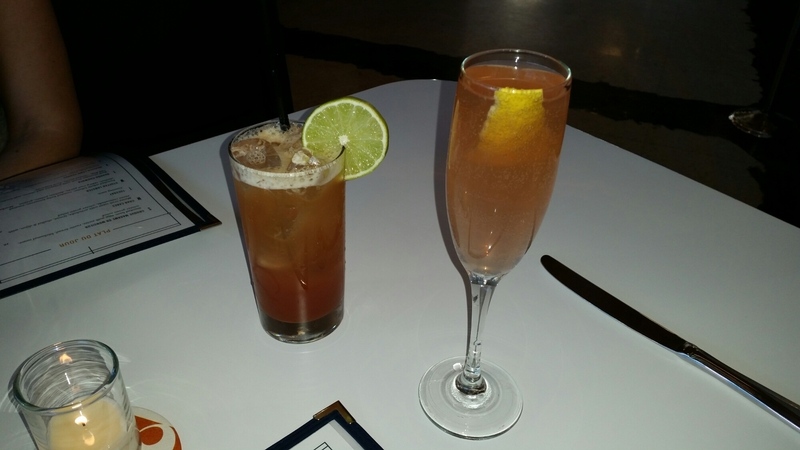 When our drinks were presented, mine was as feminine as expected. Served in a champagne glass with a lemon zest, the bubbly beverage was ready to be sipped, so I put it to my pursed lips with my pinkie high in the air. The fizzy liquid was citrusy and heavy on the prosecco. The gin was not overly apparent, but that was probably a good thing as I think too much gin would have altered the cocktail in a negative way. It was a nicely put together concoction and I looked forward to more sips before and during my meal. My wife raved about hers and seemed to appreciate the slight diversion from her beloved dark and stormy. With a few drink drops down the drain, we settled on appetizers and put in those orders. I went with one of my favorites, Classic Deviled Eggs – pickled mustard seeds, paprika, smoked bacon – and she the Caramelized Onion Dip – sherry, ricotta, goat cheese, mascarpone, house made rosemary seasoned potato chips. 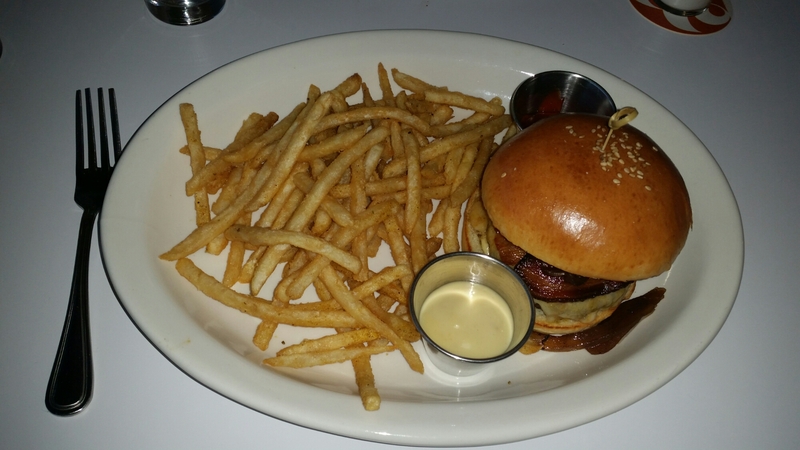 We decided to wait a bit before ordering the main course, but I eventually went with a well done version of The Burger – brisket burger, smoked bacon, grilled sweet onion, dijonaise, cheddar cheese blend, sesame seed bun, fries, aioli. 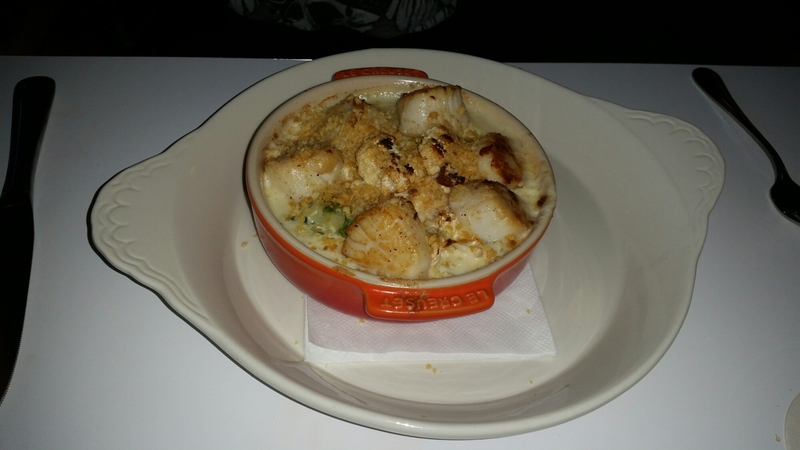 Mrs. Portlandeater ordered the plate of the day – Maine Scallop Gratinee – roasted fennel cream, creme fraiche, green rice, lemon, cauliflower, bread crumbs. I had considered that, but went with the burger instead since I’m not a fan of fennel. Just after ordering entrees, we got our apps. At that same time, the restaurant started getting very full both at the bar and tables, though I hardly noticed as I tuned out the world around me and focused on the matters at hand. Both the eggs and the chips and dip pretty much looked as expected except that the eggs were sliced crosswise instead of lengthwise. As those uniquely sliced chicken seeds sat in front of me, I started salivating. I quickly took one with its little bits of bacon on top and shuffled it right into my mouth. All the ingredients shined, but the pickled mustard seed was the brightest as the vinegar and mustard flavors permeated throughout. 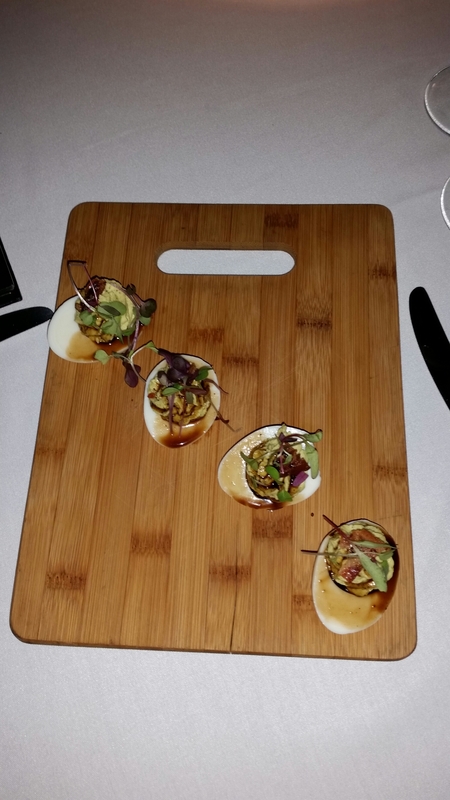 I appreciated the strong, but traditional deviled egg taste. The bacon added just a slight smoke which was plenty considering how great the rest of the egg was without it. After consuming a couple eggs, I tried the chips and dip which my wife was already eating. The chips alone were delicious and crunchy. 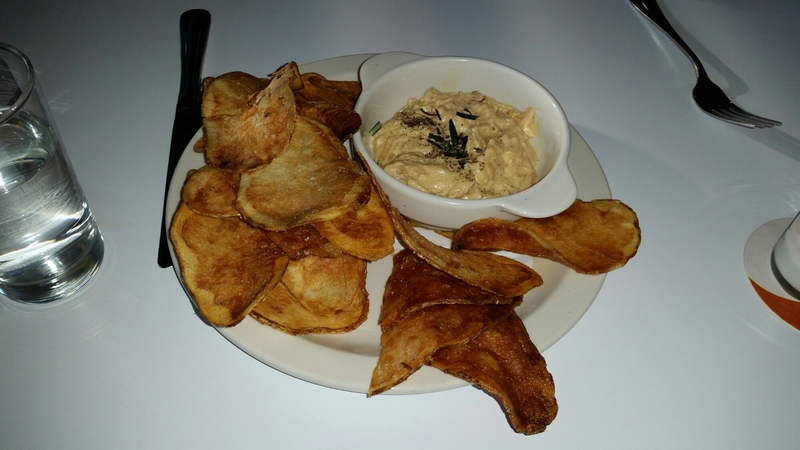 It’s hard to argue with freshly made tater chips, but I was dying to sample the dip too. An initial dive into it revealed a significant inclusion of long, stringy caramelized onions mixed into the cheese blend. A mouthful of the chip/dip combo elicited a mild, slightly sweet flavor which didn’t overpower the chips at all. It was another outstanding app. I sucked down the eggs and crunched on the tater chips relentlessly until everything was finished. Our entrees came out a little while after our apps were done and my wife ordered another dark and shrubby. I inspected my burger and saw all the ingredients layered on top of the patty. A sizable portion of fries sat next to it with little cups of both ketchup and aioli for dipping. I opened my mouth wide for the mound of meat which was piled high. I took a bite and savored each piece of the stack. I enjoyed the many flavors included in the burger as they worked well together, but particularly loved the way the dijonaise and cheese came together to add a light, creamy tinge to the significant sandwich. The fries were also excellent and supremely seasoned. I used excessive amounts of both the ketchup and aioli to accompany them on their way into my mouth which. My wife worked at her scallops as I uncovered all the facets of my burger. She loved the trifecta of drink, app, and entree and I was thoroughly enjoying mine too. As dijonaise dripped down my chin, I continued to chow down on the well done, well-executed burger. I finished it, then slid my wife’s plate of sea supper in my general direction and grabbed one of them and a piece of cauliflower. After a couple chews, I determined that they were pretty good, but for me had too much fennel. Maybe any fennel at all would have been too much for me, so I was happy that I got the burger; it had been an ordering success. After dinner, we contemplated dessert. The waiter provided a list of four options which all sounded sufficient, but I wasn’t feeling like something overly sweet. 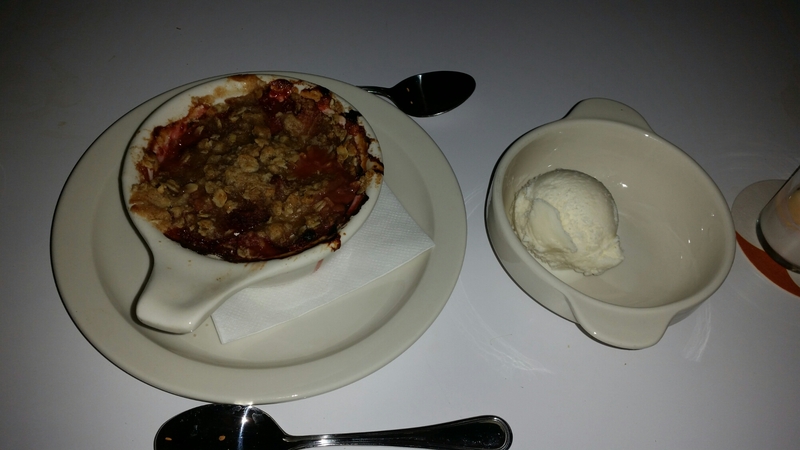 Only one dessert – a Strawberry Rhubarb Crumble with vanilla ice cream – seemed to have potential in the not-too-sugary category, so we ordered that with the ice cream on the side. The entire time we waited, I fretted about how sweet it would be and if I had made the right decision. My fretting was interrupted by delivery of the actual dessert and a quick poke at it revealed a very hot dish. I put on my waiting hat and relaxed while it cooled down. In order to speed the process, my wife dished out half of the dessert onto a small plate for herself and I took the original plate as my own. Once the crumble was finally cooled enough to make it edible, I tried it and it lived up to all of my strawberry rhubarb fantasies. The natural flavor of the rhubarb, which is too often overwhelmed by sugar, was present. The tart finisher was perfect with a nice crunch from the crumble on top. I’m sure tart desserts aren’t everyone’s pleasure, but I felt that the treat played up rhubarb’s fresh, natural flavor to create magic. As I finished the awesome dish, I noted that the restaurant was now packed and the volume was high. It didn’t bother me, but it got to the point that I did have to raise my voice to speak to my wife across the table. We came to a close on the meal and settled the bill. It came to $100 bucks prior to tip. From the drink to the dessert, they produced a stellar spread. I felt the service was particularly good too. Our waiter alone was top notch, but the addition of host and hostess assisting at times provided a great team to take care of us. I would highly recommend Woodford F & B. I didn’t know anything about them before showing up, but a lot of people certainly did, because they were busy. If you want to avoid the crowd, go early. If you want to party, go late. But do go, because you can’t go wrong with Woodford’s food or their beverage. Hungry for more? Get notified whenever Peterpeterportlandeater releases a new blog entry by clicking the “Follow” button on the right side of this page. Seriously, do it. What are you waiting for? Feel free to email me at peterpeterportlandeater@yahoo.com with any thoughts, suggestions, criticisms, or otherwise helpful info or post your thoughts below. Also, like the Peterpeterportlandeater page on Facebook and follow @portlandeater on Twitter. This entry was posted in Portland, ME food on April 27, 2016 by peterpeterportlandeater. Opening a restaurant that focuses heavily on food and drink popular a few decades ago seems like a risky proposition, but that’s exactly what Crooners and Cocktails did last year. The Exchange St. location doesn’t just serve the old-timey stuff either, its decor and ambiance fit the bill too. Everything from the ceiling and chandeliers, to the music and beyond drum up thoughs of an era that has long since passed. I wasn’t overly enthusiastic about the idea of an old style restaurant offering items like Clams Casino and Chicken Cacciatore, but like everything else, I knew I had to give it a try before judging. We were meeting friends, but arrived first and got our table right away. Two seats were against the wall and the other two were at the table ends. I sat down and immediately felt like a puppet. The seat was really low and it felt the majority of me was under the table while my head and neck were above. It wasn’t a great start, but getting the food and drink menu at the same time our friends arrived made me forget about it. As they too experienced the seat unusually close to the floor, we started to scan for beverages and discuss what might be in store for the evening. We were also warned that they were out of a couple menu items, including the Lobster Bisque, which my wife had considered ordering. While I was looking for a cocktail to fill the emptiness inside of me, I realized that the combo food and drink menu was quite convenient. I didn’t need to switch menus to see everything they had to offer, I just flipped back and forth between pages. It was a minor detail, but one I wouldn’t mind seeing at other restaurants. Once that little bit of joy flew by, I realized I was having trouble deciding between a classic concoction, a manly drink, a fruity escapade, or some combination thereof. I found myself leaning toward a classic since it fit the theme, but I was also fascinated by their “named” drinks – the Frank Sinatra was Jack, rocks, splash water; Dean Martin included Stoli, Fino Sherry rinse, flamed orange; Sammy Davis Jr. was Jack and glass bottle Coke. Get it? Sticking with an oldie but goodie, I eventually decided on a Rob Roy – Dewar’s, sweet vermouth, bitters. My wife went with a Twist and Shout – Stoli Ohranj, St. Germain, lemon, prossecco. 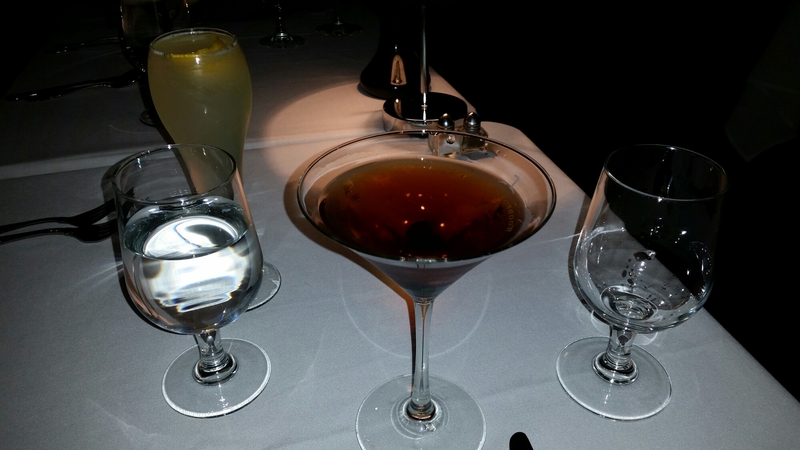 Our counterparts ordered a Manhattan – same as my Rob Roy but with Woodford Reserve instead of Dewars – and a Dean Martin. Once the drink orders were in, we started the back-and-forth about what we wanted to eat. There was a lot that looked good to me as I searched for an app and an entree to satiate my hunger and continue my decadent American ways. After a little discussion, it seemed like we were ready to put in our food. Once our drinks arrived, we placed our orders. It was easy – two each of Daily Chef’s Selection of Deviled Eggs; Spring Vegetable Risotto with a sweet pea basil puree, asparagus, arugula and cherry tomatoes finished with lemon and parmesan; and House Made Meatloaf en croute with a classic mushroom duxelle, roasted truffle cheddar mashed potatoes and sweet onion bourbon gravy served with charred bacon balsamic Brussels spouts. Each couple would have one of each item. Our server was thrilled with the simplicity. While the waitress walked away, we started to tip our glasses up to our mouths. My Rob Roy was perfectly executed – a little on the sweet side with plenty of scotch machismo mixed in. I took a second sip and caught a glimpse of Young Frankenstein playing on the TV at the bar. My wife sipped her luscious liquid and seemed quite pleased with it, so I tried it too. It was indeed excellent. The fruity, flowery flavors were made whole with the lemon creating a base. It was a little bit tropical and a lot bit tasty. Everyone seemed pleased with their initial gulps as we continued drinking and chatted about all things Rat Pack. Before long, we had four half-eggs in front of us. They were pleasing to the eyes. The charred bacon Brussels sprout cackleberry was topped with bit of pig, fig balsamic, and a few sprouty greens for garnish. 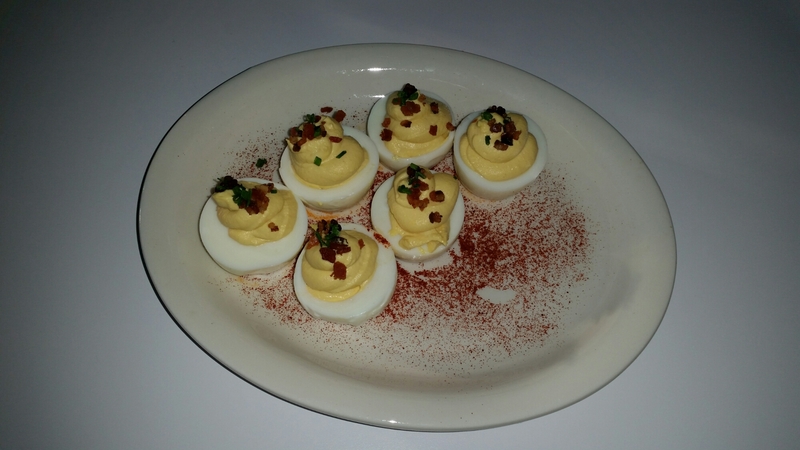 I took one into my deviled egg hole and chomped on it like a man possessed…by a devil…ed egg. To be fair, I love most any iteration of the stuffed spawn, but these were quite good even though I found them a bit unusual. There was definitely a serious Brussels bite to the yolk which was followed some bacon business and the balsamic blast. It was a little pungent, a tad smokey, and had an acidic finality. I ate them faster than I should have considering Mrs. Portlandeater wasn’t having any, and finished them before the couple across from me sharing a single order. While everyone was eying me and my egg gluttony, we waited for our loaf and risotto. Soon it came out. 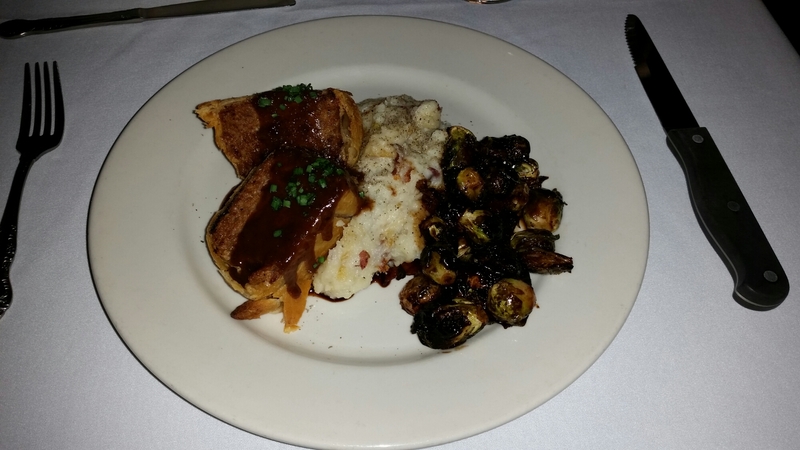 The meatloaf was a double slice with the mashed to the right and the sprouts to the right of those. 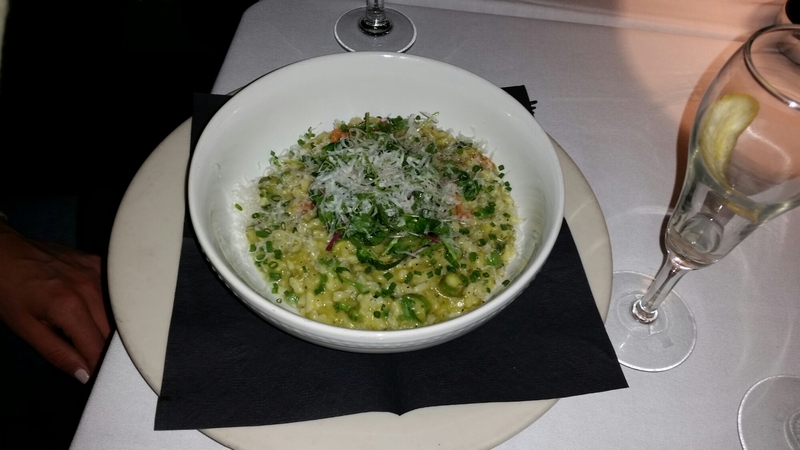 The risotto was filled with greenery and definitely looked very seasonal. I stared down my meatloaf and when it blinked, I knew it was time to dive in. The slices were wrapped in puffed pastry – that’s the “en croute” – which makes everything better, and topped with the duxelle. With my first foray into it, I found the dish to be ravishing. The duxelle was absolutely outstanding and added a multifaceted mushroom sauce to the mix. The pastry was a perfect crusty addition and the meatloaf had plenty of non-meat parts to make it slightly fluffy and flavor-filled. Every part of it worked well together as both texture and flavor combined to make sweet love to my mouth. Moving on to my sides, I went in for the mashed and found the soft, creamy potatoes to be delicious – not overly burdened by truffle cheddar, but simply and appropriately doused with it to transform what otherwise would have been a very basic preparation. The Brussels – same as in the eggs – were practically divine with their gravy of which I found the sweet onion played up the natural flavor of the green near-spheres while the bourbon added a bit of “how’s your father?” to the sassy side dish. A bite of my better half’s risotto revealed a masterful spring spread with awesome fresh basil and a blend of creamy greenery. As forks were frantically hitting mouths and the waitress checked on us, a couple more drinks were ordered – she with another Twist and Shout and our partners in dining with an All Shook Up – Plymouth Gin, lemon, ginger syrup, soda, egg white. We continued the eating and drinking party, chatting about our lives, and stuffing our bellies. Eventually, we even moved on to a dessert menu to consider the sweet life. Unfortunately, the one item which was given some thought was the one they were out of. We ultimately decided to pass. At the end of meal time, we were ready to move on to other pursuits, but first, we had to pay for the pleasures which we had consumed. Our meal came to 117 bones with tax and tip. The meal was a little pricey, but much better than I expected. The signature cocktails were actually quite reasonable at 10 each, so I suppose the combination of the two was about where they should have been. Crooners and Cocktails is doing it right. Their theme, which caused me some concern initially, was well-played and they nailed all its important parts. I’m definitely going back and trying some more of their classics. You want old school? They’ve got it. Head there soon and get ready to channel your inner Sinatra. This entry was posted in Portland, ME food on April 20, 2016 by peterpeterportlandeater. 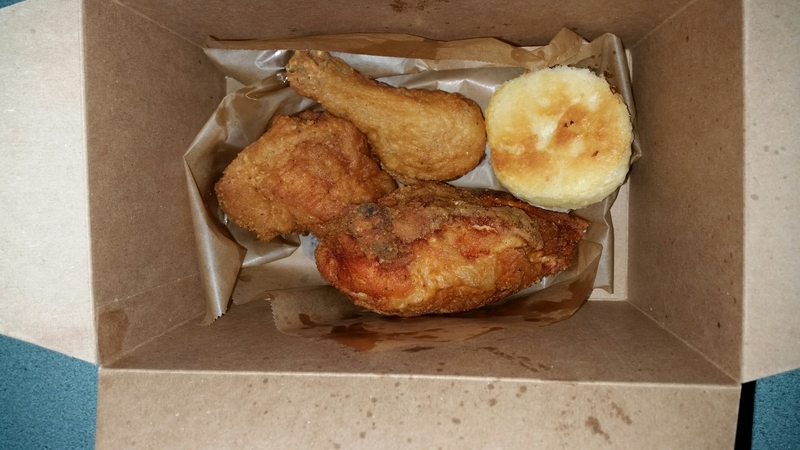 I don’t often review takeout joints, but after a few visits to Figgy’s, which opened last year on the corner of Walker and Congress, I felt it was time to share my thoughts about the slightly hidden location serving antibiotic and cage free fried chicken with all the fixins. The eatery’s first point of interest is their walk-up window, herein referred to as the “chicken window”. The right side is for ordering , the left for pickup, and behind it are the friendly chicken providers who take your order with a smile. Figgy’s offers takeout and catering, but does offer some outdoor picnic table seating if your desire is to eat there. I like to take my order home and relax with my meal, but on a nice summer day, it wouldn’t be crazy to enjoy your chicken on location. On my last visit, as I always do, I reviewed the menu hanging next to the chicken window. With main events of skillet fried chicken and wings, it also included biscuit sandwiches, soup, salad, sides, and dessert. There were specials to add to the list of choices. I had the full hunger, so I was ready to spare no expense. After mixing it up with my wife, we agreed on what to order. We started with a Half Bird – drumstick, thigh, and breast – and a half dozen Garlic and Soy Wings – lightly battered and double fried Korean style. 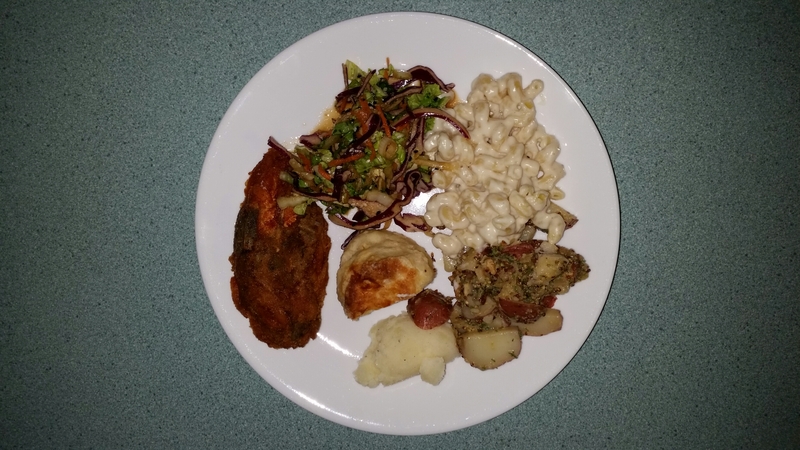 Then we went a little insane with the sides, ordering a pint of the Really Creamy Mac N’ Cheesey and a cup each of Buttermilk Mashed Maine Potatoes, German Potato Salad, and Sesame Cole Slaw. The crew at Figgy’s wasted no time in creating our order and within several minutes, our big bag of food was handed to us and we were on our way to consuming fistfuls of chicken. I quickly headed home and plated the bird and sides and got ready to eat what was before me. I started with the fried breast which I split with Mrs. Portlandeater. The menu touts that their chicken is simply seasoned, floured, and fried. A bite revealed the beautiful outer coating developed by that preparation. The crisp shell produced an excellent textured taste with a blend of what was certainly fewer than 11 herbs and spices and probably just a very necessary salt and pepper blend. The combination of crisped skin and coating only opened the door to the tender, juicy meat that followed, producing a hearty, crunchy, moist mouth mixture. This was really good fried chicken. Really, really good. As I gnawed on my defeathered friend, I caught the biscuit that came with it out of the corner of my eye. I had shared that with my wife too. I grabbed the split biscuit and chewed off a portion. It was a pretty standard example of the crumbly bread and was small, so I finished it in a couple bites and moved on to some wings. I shoved a garlic and soy flapper into the horizontal cavity between my lips. Whoa woah whoa, stop the clock! As if the seriously sauced, sweet and salty, garlic-glazed bird bit wasn’t good enough, the double frying produced a bubbly, blistered skin that caused a snap with each bite. You know the soggy wings you get at some pizza places where the skin and the meat have essentially the same hardness? Well these definitely weren’t that. They were spectacular. 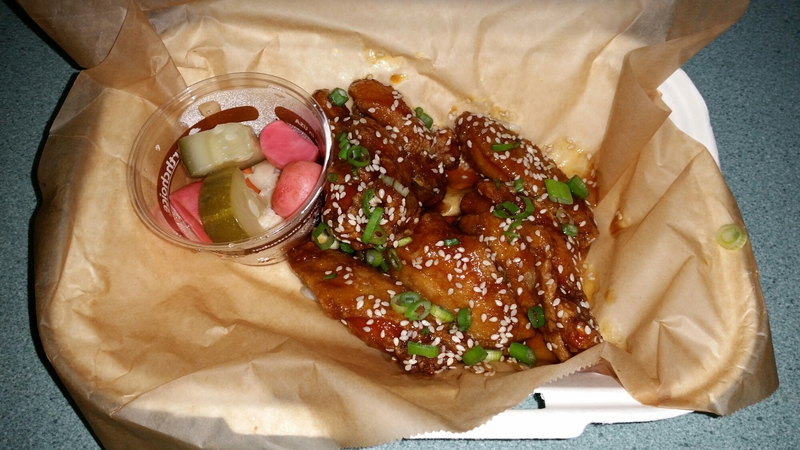 No details were forgotten either as the wings were finished with sesame seeds and green onions. I alternated between wings and the delicious house pickles that came with them before getting to my other food. Adding a thigh to my plate, I started digging into the sides I had meticulously portioned onto it. I started with the Really Creamy Mac N’ Cheesey, placing as many spiral pasta pieces as possible on my fork and deftly transporting them to my mouth for safe keeping. Holy macaroni! The name of the dish was appropriate as I laid upon my taste buds the cheesiest, creamiest, mac and cheese I could imagine – one of the very best I ever had and choc full of gooey goodness. I gave a salacious stare to the rest of my mac and took a break to cool off and move on through to the other sides. Only a small amount of the buttermilk mashed graced my plate as they were primarily ordered for my wife, but the rich, smooth taters gave another look to the classic spud preparation. I then skipped over to the potato salad which had been daring me to try it for some time. The salad was tossed with whole grain mustard, bacon, and vinegar as its auxiliary ingredients. The flavor combination was top notch with potent mustard power and every bite ending with an acidic slap to the back of the throat as the vinegar made itself known. It was another winning dish. A bite of the sesame slaw provided a fresh change of pace to the meal with the long-time fried chicken side giving me yet another reason to say “yum”. The black and white sesame seed speckled veggies had a vinaigrette coating and pleased the palate with their light and barely there, nutty flavor. As I rotated between sides and chicken, I smiled with every opening and closing of my jaw. I took double-sized bites of macaroni and immediately had a craving for potato salad, so I ate that and had a craving for slaw. I rotated between eating all three, wanting one as I was eating the other, unable to focus on any single side. Once my plate was emptied a couple times, we were almost out of everything, but I realized there was still a drumstick left. Chicken for dessert it was! I nibbled on the easily eaten piece of chicken and finished every last morsel, eliminating previous thoughts I had about having some left over for the next day. I called it a wrap and cleaned myself, as the chicken, especially the saucy wings, were a 5 out of 5 on the messiness scale. Only moments later, I sat with fried chicken belly and reminisced about my meal, placing it into the absolutely outstanding column. For about 37 bucks, we were very full and more than happy with the glorious food that was as comforting as it was invigorating. Bringing back memories of mom’s fried chicken when I was a kid, Figgy’s has turned up the volume and doubled down on the sides. Everybody wants fried chicken, but they’re still screaming at us to eat more of it by making it irresistibly grand and throwing in secondary dishes that will bring a tear to your beady, little eyes. As president of the Nommy Food League, I’m fining Figgy’s for unreasonable deliciousness. Go there right away so you can experience what I did. The fun starts with the happy little chill you’ll get when you order, but the party truly begins when the hand reaches through the chicken window and offers you the bag of goods. Do you like this? Get notified whenever Peterpeterportlandeater releases a new blog entry by clicking the “Follow” button on the right side of this page. Seriously, do it. What are you waiting for? This entry was posted in Portland, ME food on April 4, 2016 by peterpeterportlandeater.